Cozy 2 bed, 2 bath cabin in the woods with beautiful year-round mountain views. Perfect for a relaxing getaway! 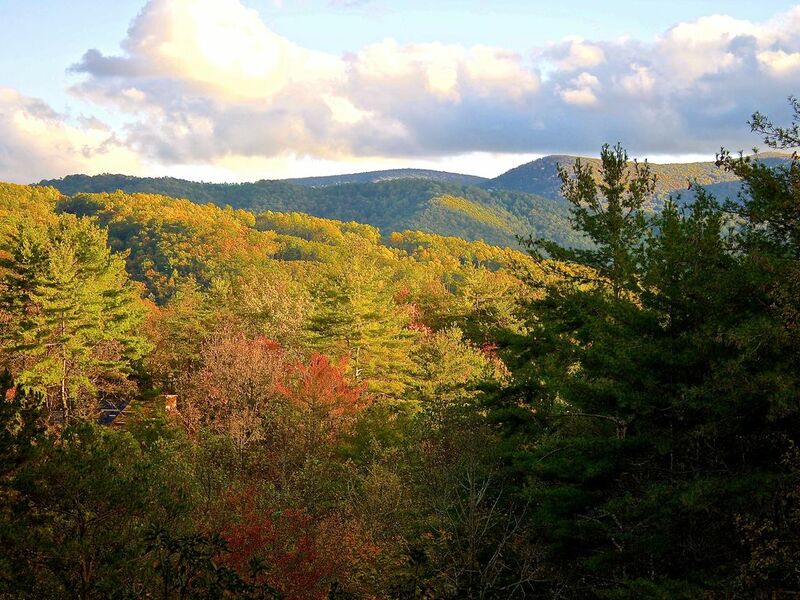 Conveniently located just a short 5 miles from Downtown Blue Ridge and the Scenic Railway. 15 mins to Lake Blue Ridge & Toccoa River. Many outdoor activities nearby. Large King suite on upper level loft and Queen bedroom on lower level. Living room and king suite have TVs equipped with Netflix and Hulu. Please note that no cable TV is provided. Screened porch to enjoy the view and changing seasons. Wood stove for those cozy nights by the fire. Outdoor fire pit perfect for s'mores and gatherings. Hello! My name is Michelle and I currently live in Atlanta. I fell in love with the North GA mountains and Blue Ridge area the first time we visited. After searching, we found our perfect home away from home and are excited to share it with others. We love hiking the area and whitewater rafting. After a fun day of outdoor activities, it's great to relax and take in the views from the porch or hammock. Make sure to check out the cute shops and restaurants in Downtown Blue Ridge during your stay. Feel free to contact me with any questions. We fell in love with the view and the unique feel of the property. We walked in and immediately felt at home. Our stay at Mountain Haven was wonderful. The cabin is the perfect blend of classic mountain cabin and modern comforts. It’s unique, not a cookie-cutter cabin. It’s furnished and appointed with great taste and comfort. We are so grateful to the owners for sharing this treasure. Cons: The outlets in the bedroom downstairs tripped the circuit breaker easily, but all the other ones seemed to work fine. Thank you so much for your review. So glad that you enjoyed the cabin. As you know, the cabin is older and the electrical is a bit quirky. I've found that as long as the heater stays plugged directly into the wall and not the power strip, then the power strip will not trip. The circuit breaker should not have tripped at all, only the power strip. Thanks again for the review! An adorable cabin, and so relaxing! Cabin was very clean and everything we needed was there as far as kitchen, laundry, etc. Owner Michelle was amazing. She got back to me very quickly if I had questions, very nice person! Cabin is very close to cute downtown Blue Ridge. We would 100% stay there again. Thanks for the kind review. So happy that you enjoyed your stay and we hope you come back again in the future! Loved the view! Loved our time here! Perfect size place for us. Very Cozy, quiet, peaceful get away. Has everything you need! My husband and I along with our 7 year old daughter escaped to the beautiful and relaxing cabin for much needed escape from the city. Unfortunately it rained all weekend but we had a wonderful time. This cabin is perfect with exceptional views even on a gloomy cloudy day. Even with the rainy weather it wasn't too cold so we were able to enjoy the front screened in porch for all our meals. Inside the cabin was comfy cozy and stocked full of everything one would need plus more! The location was also great. Close to Blue Ridge, Fort Mountain and the Aska Trails. We would love to come back during warmer weather to take advantage of all the other activities that were closed for the winter months. The last day we were granted with ALL the sun and my daughter really enjoyed hanging out on the hammock while we packed and cleaned up. I even hopped in there for one last quick moment of peace and quiet. Thank you again for having us we really had a wonderful time! The cabin was beautiful! It rained most of the weekend, but that didn’t matter. We were warm and cozy with lovely views. The kitchen had all the basics. Everything was clean and well maintained. Convenient to Blue Ridge, Ellijay, and lots of hiking trails. Thanks for everything! !